You are here: Home / Chalk Eagle among top 10 wordless picture books! 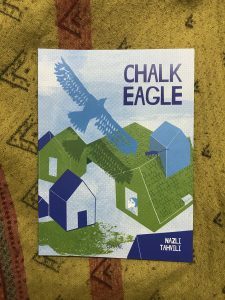 Books like Chalk Eagle are valuable and versatile! Wordless picture books like Chalk Eagle have an amazing ability to transcend language barriers! For World Kid Lit Month, translator and picture-book connoisseur Laura Taylor chose it as one of the 10 best wordless picture books from around the world! Read what she had to say below! Wordless picture books are a versatile and valuable resource across settings. In 2012, IBBY launched a Silent Books project to create a library of books that could be accessed and enjoyed by refugees from Africa and the Middle East and local children on the Italian island of Lampedusa. There are now three collections of Silent Books, comprising a total of almost 250 titles from a range of countries. Here is a much smaller list of 10 wordless picture books by creators from around the world. Which ones have you read? Which ones would you add? Using a little chalk, a young boy draws an eagle and himself and the two of them fly out of a busy city and into a land of adventure and imagination. Features stunning screen-printed illustrations by award-winning Iranian artist Nazli Tahvili, whose husband used to draw eagles on the rooftop of his house when he was a child. Watch the stunning book trailer!